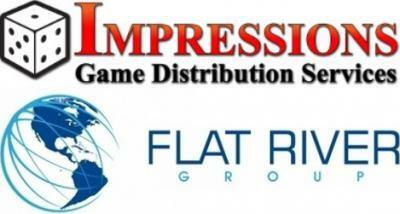 Flat River Group, LLC announces the purchase of Impressions Game Distribution Services, a California-based game consolidator. Impressions will join Flat River Group as a division with the Impressions business unit continuing to run out of its Fort Wayne, Indiana location with current staff. The change will be effective January 1, 2019. Game publishers will benefit from this partnership, offering a host of business-to-business services under one roof. For more information regarding distribution to mass market retailers, wholesale to distributors worldwide, Kickstarter fulfillment or details about the new acquisition, please contact Matt Stahlin at matt@flatrivergroup.com or Aldo Ghiozzi at aldo@impressionsadv.net. With distribution centers in Belding and Kentwood, Michigan, Flat River Group is the largest toy and game distributor in the United States. Flat River Group was founded in 2011 and acts as a distributor of niche and mainstream toy and game products. The company is also a full-service provider of warehousing and fulfillment to a variety of mass-market retailers in the U.S. and Canada. It recently added Kickstarter fulfillment to its suite of services. The company currently has over 50 full-time employees and brings in hundreds of seasonal workers for fourth quarter staffing needs. Impressions is the oldest and longest-running game consolidator in the industry and handles the wholesale side for over 80 game publishers and over 40 distributors worldwide. Aldo Ghiozzi started his career as a small press game publisher, and established Impressions in 2000. He is also the founder and creator of Free RPG Day. More information about Impressions can be found at www.impressionsadv.net.